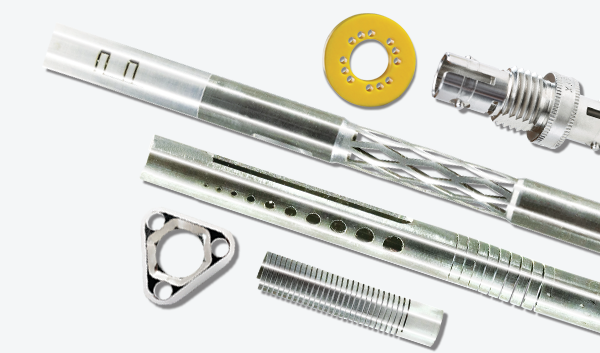 NILES, Ill.--Parts manufactured for the aerospace/aviation industry--particularly those with critical functions--are often complex designs with extremely tight tolerances. Suppliers to the industry need to be more than technically adept; they must also have a good understanding of their customers' needs and be able to communicate well with them--from design through delivery of a high-quality part. According to Joseph Haupers, sales manager at Swiss Precision Machining (SPM), OEMs that need complex, precision parts are more apt to get what they need by sourcing with domestic suppliers. "Many of the parts we come across are still being engineered, and by working domestically, we can bring the part to market in a more expedient time frame," says Haupers. "Usually, when you're dealing with more complex parts that require close communication between the customer and the supplier, it's much more efficient to do business domestically rather than go offshore." Swiss Precision Machining (www.spmswiss.com), a precision parts manufacturer located in Niles, Illinois, began operating in 1979 with three Swiss-style cam machines. Today, the company has more than 60 different machines, including Swiss Automatic Screw Machines, CNC Swiss-Style Turning Centers with 2-axis to 13-axis capabilities, and CNC Vertical Machining Centers with 5-Axis capability. In addition to serving the aerospace industry, SPM makes parts for the surgical, automotive, fiber optics, electronics, fluid motion, and hydraulics industries, among others. "By staying up with the latest machining technologies, we find we can offer a quality product at a competitive price," says Haupers. The company recently began making parts for F-16 Fighter Jets. According to Haupers, the parts are very intricate and have stringent requirements that include zero defects. "We have machines that go up to 13 axes, so we pretty much drop parts that are complete," he notes. "We have to deal with extremely tight tolerances for inside and outside diameters. The sizes of our parts can be very small, from about 0.040-inch in diameter, up to 1-inch in diameter." Bayonet fittings, which require a curvature to be milled inside the part, are another example of a complex part configuration that Swiss Precision Machining is able to handle. Some of the parts are electrical bayonet swivel connectors that are used in the cockpit of the F-16 for electronic components. "Most of these parts are made out of stainless steel, and are electro-polished to eliminate burrs because there are so many different dimensions, drilled holes, threaded holes, and bores," says Haupers. "Even microscopic burrs can create problems, so we electro-polish the parts to get smooth parts that will function and operate the way the customer wants them to. Our motto is, 'If you have a blueprint in front of you for a complex part, make the part better than the customer wants it to be.'" In order to deliver a high quality finished part, Haupers believes it's important to understand how the part will function--its end use. Understanding the part's function makes it much easier to recommend process changes or part revisions that may be necessary to produce a more economical part. Doing business with a domestic supplier, he says, is key to expediting this communication process. "Understanding the customer's needs and requirements means communicating with their engineering, quality, and purchasing departments to ensure success," says Haupers. "You want to make sure your company is easy to deal with and that the customer has total confidence in you. If you can achieve this, the customer will focus on their company goals and both companies will benefit from your customer's growth." Haupers relates a story about a customer that once purchased a company that manufactured rotary toothbrushes overseas. The customer brought the operation to the states, outsourced the machined parts to SPM, and started assembling. "He called us in a panic one day, saying that the parts were bad and the units were binding," says Haupers. "He was so nervous that he was on our doorstep the very next day. "He laid his part and assembly prints down in front of us and we started to examine everything," he continued. "First, we measured all our parts and found that they were in fact, all in tolerance. What else could be wrong? We examined his assembly prints for all the parts that went into this unit, even the ones we didn't make. We then realized and showed him that the prints were wrong and that the units would not work. He immediately said, 'Can you fix this? I'm in a desperate situation!' Of course, we told him we could. We spent the next two days redesigning the unit to function. This also meant we had to fly to his plastic molder to explain the changes and get him to change the molds, quickly. "Within one week, he was assembling fully functional units. This wasn't an easy task, given the time constraint and the magnitude of the problem. But we put our staff on it, knowing full well that this man's company was on the line. That was twenty-five years ago, and this man is still a customer today." Swiss Precision Machining was able to apply its knowledge of press fits, assemblies, and how parts should function together--all of which were crucial to re-engineering the project from the ground up. "First, we looked at our parts, manufactured them to new specifications, and then made a mockup of the full assembly to put them in," Haupers explains. "We then tested that and we knew we were successful."